and a few times in chicago. wilhelm has been developing a line of string instruments he calls mosesa since 2012. (several other instruments came before.) as you can see in the photo, it is horizontally oriented without a fingerboard and fretboard. the idea is to create an instrument that allows for maximum access to the string spectrum and allows various sounding boards to be attached. 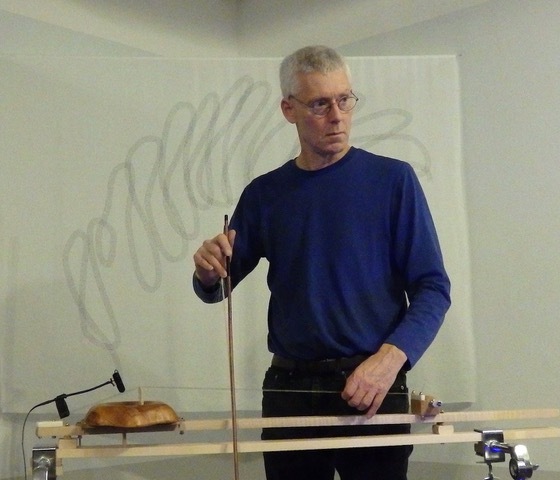 the instrument sound is picked up using microphones to emphasize the sonic quality of acoustic materials, plastic bottles in versions 1-7, cedar plates and thin wood bowls in versions 8 and 9. characteristically, wilhelm bows the instrument with an erhu bow, which allows the range of high overtones to the full, clear tones of the string to be heard.